April 6-12th, 2014 is a special week dedicated to the millions of volunteers all across Canada. 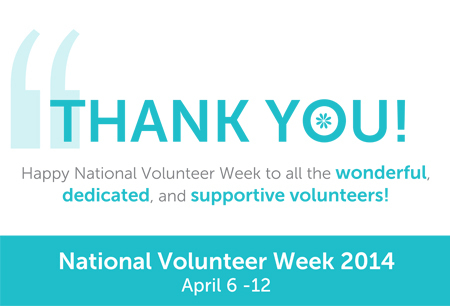 So, we want to take this opportunity to celebrate, recognize, and most importantly, thank our remarkable volunteers who generously give their time to our organization. We are overjoyed to share that the total number of volunteer hours from 2013 was 26,777! Our volunteers are at the heart of what we strive for as an organization. Each and every one of the individuals who support our organization allow us to better serve our clients and make a difference in the lives of so many deserving people. They truly help us change lives. Volunteers help our Centre in a variety of ways. They can be the supportive first contact to individuals reaching out through the Call Centre, assist with filing and organizing records, help with events and so much more. Our volunteers have shaped who we are as an organization and helped us to successfully meet the ever-changing needs of our community. Not only do we notice the positive impact volunteers make to the Centre, we also see our volunteers recognize the impact it makes in their own lives. It is humbling to know that the volunteers cherish their experiences as much as we value their devoted support. We would not be where we are today without our strong backing of volunteers. And for that, we will be ever grateful. Please visit href=”http://www.calgarycounselling.com/donate/get-involved/ if you want to learn more about volunteer opportunities at Calgary Counselling Centre.